Looking west along Merrimac Way near Orange Coast College in April 2018. Merrimac Way is a four-lane divided road that primarily runs between Harbor Boulevard and Fairview Road in Costa Mesa, providing access to Orange Coast College, the Costa Mesa LDS Institute, the Sunset Cove Apartments, the Coast Apartments, Suburban Cadillac/Buick/GMC, and Aura (a new home development). Merrimac Way between Harbor Blvd. and Fairview Rd. 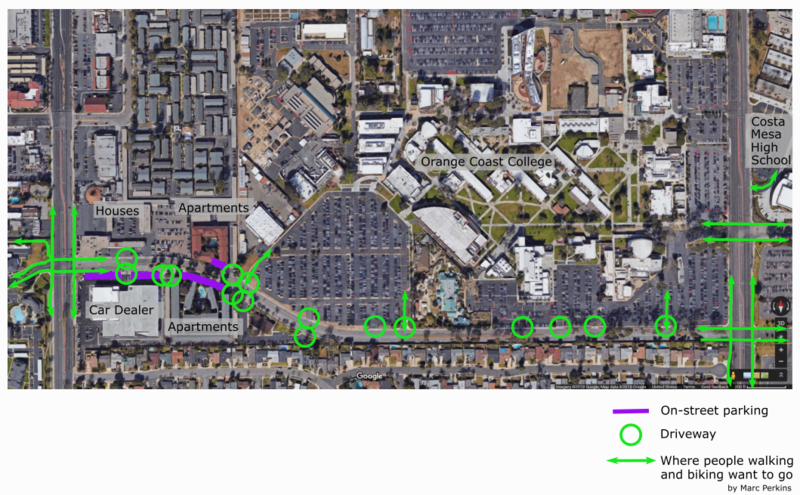 in Costa Mesa, with driveways (green circles), on-street parking (purple lines), and bike/pedestrian travel routes (green arrows) highlighted. Satellite Image from Google Maps, 2018. The speed limit is 35 mph, which cars regularly exceed, making many bicyclists feel unsafe on the road. I frequently see people bicycling on the sidwalk. Eight of the sixteen driveways are packed into the western 1,000 feet of the street. In the same 1,000 foot region where there are eight driveways, there is also parallel on-street parking to the right of the bike lane, exposing people on bicycles to the risk of opening car doors and cars pulling out into traffic. Cars and delivery trucks regularly double-park around the apartment buildings and car dealership, making that western-region of the street even more hazardous. In fact, had I not been aware of the risks of opening car doors I easily could have been hit by the opening door of a double-parked car in this location. 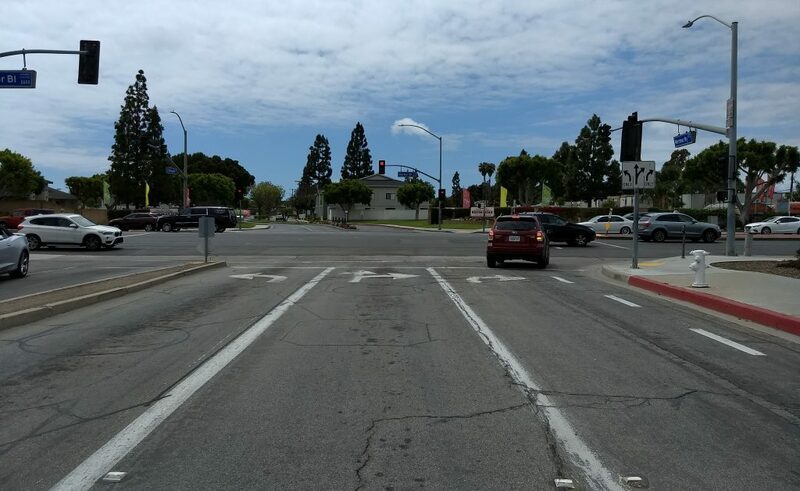 The westernmost entry to Orange Coast College (next to the apartments) is blocked from the southern side of the road by a median, meaning that cyclists have to go well out of their way to enter the campus from the south-side of the street. This leads to many cyclists riding against traffic either in the street or on the sidewalk at the north-western edge of the street, which is quite dangerous. There is no marked crossing at all along the entire length of the street. This is especially problematic at the western entrance to Orange Coast College, where people walking can be frequently seen crossing without assistance (both faculty/staff/students going to/from campus and also employees of the car dealership who park on campus). The majority of the southern side of the street lacks a sidewalk (everywhere east of the LDS Institute). The bike lane at both the western and eastern ends is striped to the right of a dedicated right-turn lane, creating the hazardous condition of a bicyclist wanting to go straight while being positioned to the right of a turning car. Instead, the bike lane should be striped so that bicyclists are adjacent to or in the right-most lane that goes straight. Merrimac Way at Harbor Boulevard, looking west. Note that the bike lane (here a dashed line) is pained to the right of the dedicated right-turn lane. People install the demonstration protected bike lane along Merrimac Way in April 2018. 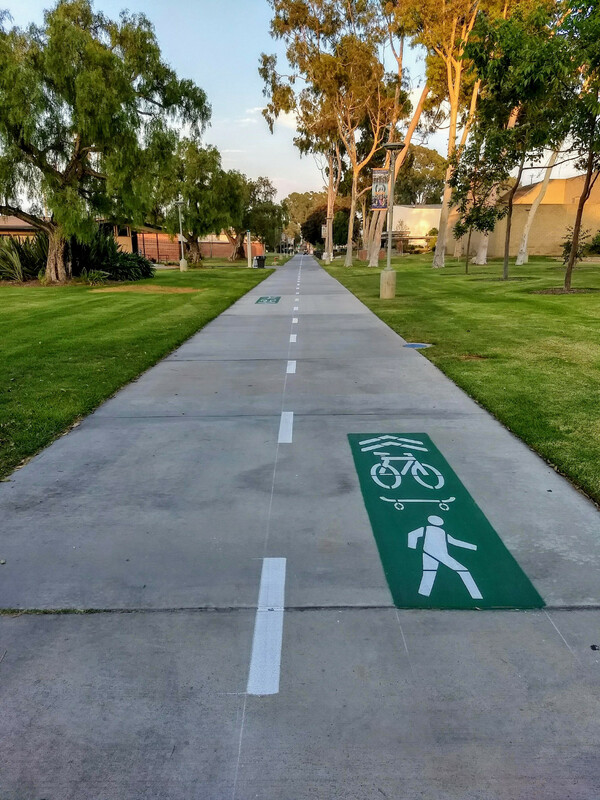 Costa Mesa’s new Active Transportation plan includes installation of a protected bike lane along Merrimac Way. To help explore what this would look like, the City of Costa Mesa applied for and received a SCAG Tactical Urbansim grant to fund installation of a temporary protected bike lane along Merrimac Way. 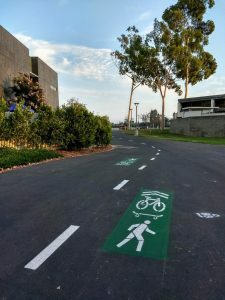 The city formed an advisory committee to help them design the demonstration (including members of the Costa Mesa Bikeway and Walkability Committee; Orange Coast College students, staff, and faculty; city staff; Global Green; Studio 111; LANI; and SCAG). 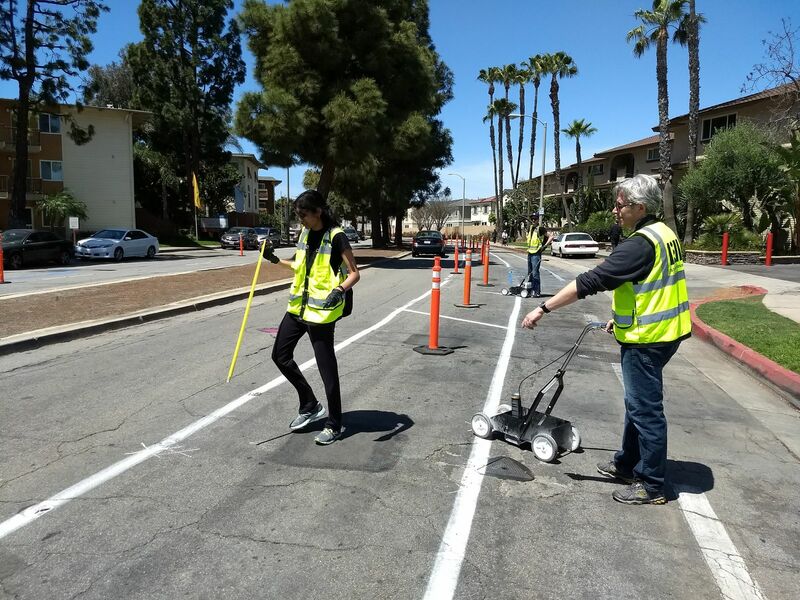 The demonstration protected bike lane was installed April 18, in conjunction with Orange Coast College’s installation of their own demonstration campus cycling improvements for Green Coast Day, and left up for a month. The city held a community outreach event, which attracted hundreds of residents. 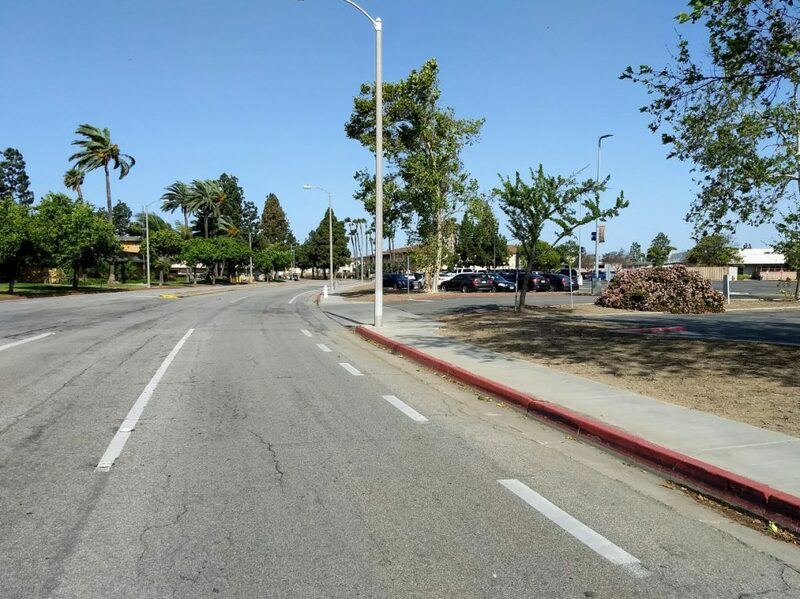 The design of the demonstration protected bike lane on Merrimac Way between Harbor Blvd. and Fairview Rd. 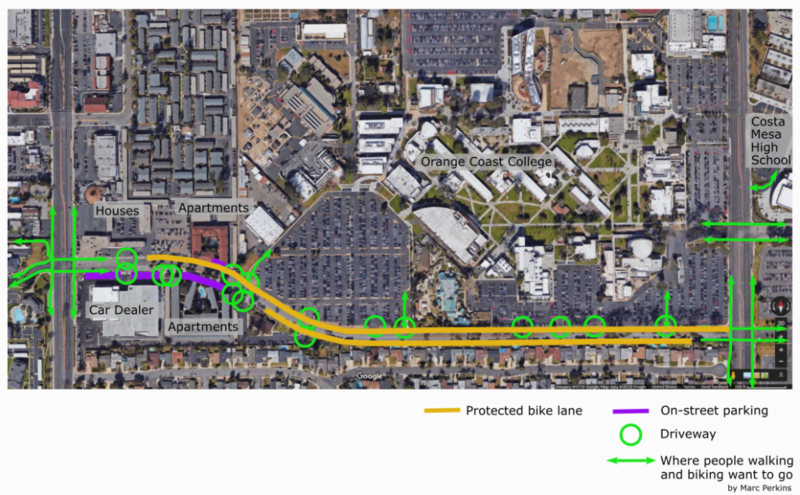 in Costa Mesa, with driveways, on-street parking, and bike/pedestrian travel routes highlighted; yellow lines indicate locations where the protected bike lane was installed. Satellite Image from Google Maps, 2018. The demonstration was carried out by closing the right-hand lane of traffic in each direction for a portion of the length of the street. The closed-off lane was marked primarily with tall cones, but also indicated with spray chalk and painted plungers. 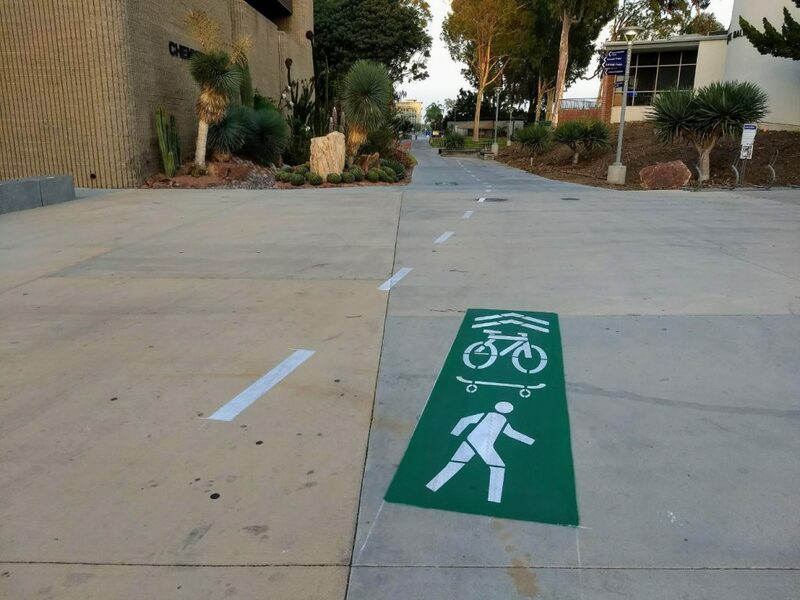 Orange Coast College’s Wheeled Transportation Loop, seen freshly painted near Allied Health and Technology. The college first demonstrated this wheeled transportation loop in conjunction with Green Coast Day and Explore Merrimac back in April. At that time it was marked with spray chalk and temporary signage; due to the success of that demonstration, it’s now marked with paint! Map used on Orange Coast College’s “Ride the loop” sign during their April 2018 Wheeled Transportation Loop demonstration. Due to the construction of the new student center, the lower portion of the loop (that travels through the campus quad) is not able to be painted at this time. The goal of the loop is to direct people on bicycles and skateboards to wider, safer pathways via clear markings. 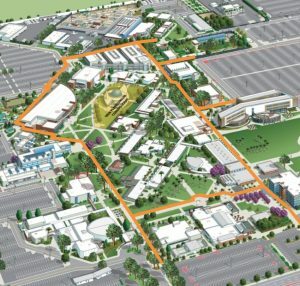 Traveling on this loop will allow users of wheeled transportation to traverse the campus in virtually no time, and also to roll to within 100 yards of all campus buildings. The markings also help alert walkers and other path users to the possible presence of bicyclists and skateboarders (so, to be clear, these are not bike lanes; they’re shared use pathways). Near Biological Sciences and Horticulture. The imagery of a bike, skateboard, and walker all in the same square is intended to show that this is a shared use pathway, with striping and arrows indicating directionality. As part of this project, the campus will also be creating dismount zones, where users are asked to walk their wheels. The largest of these is in the core of the campus (the region inside the loop), where pathways may be narrow, have pinch points, pass classroom doors, and/or have blind intersections that would be dangerous to ride through. 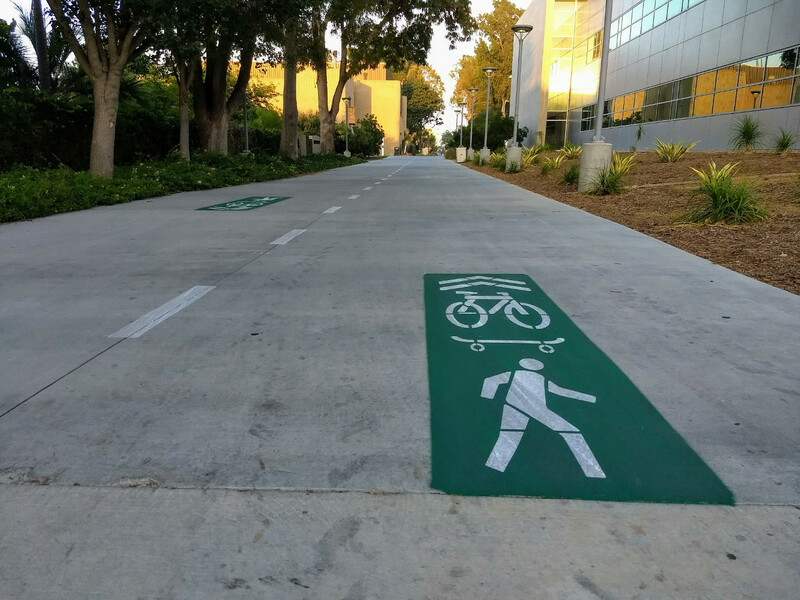 Redirecting people on bicycles and skateboards from narrow, unsafe pathways to the wide, well-marked loop should result in a much safer transportation experience for everyone at Orange Coast College. 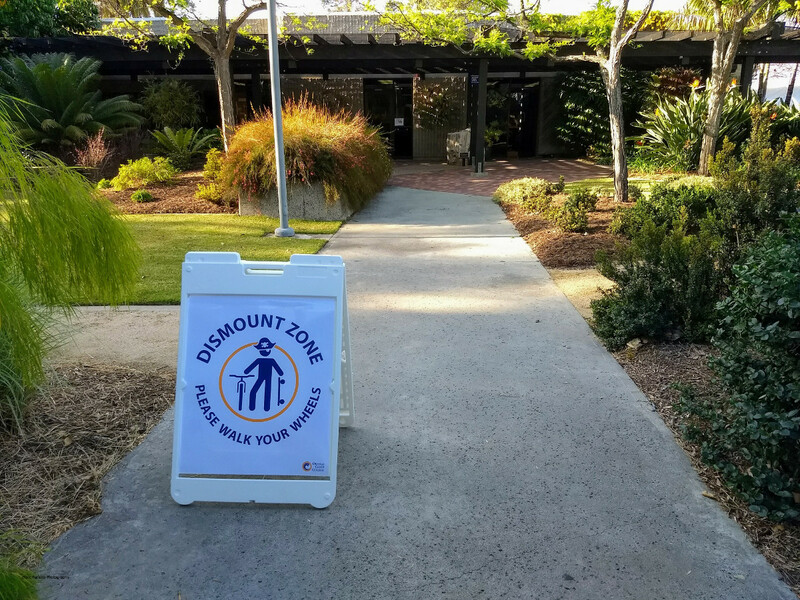 A dismount zone sign in the Horticulture Gardens seen during the April 2018 Wheeled Transportation Loop demonstration. While this is a tremendous win for those of us who ride our bikes or skateboards (or kick scooters!) to/on campus, we need to be sure that we use this new loop wisely. Just as paint can be applied, it can be removed or painted over, so please: ride responsibly on campus. And while you’re riding on campus, keep an eye out (and advocate!) for other improvements the campus is considering: mobility hubs (large bike / skateboard parking areas, complete with security cameras and seating), improved safety in parking lots (e.g., sharrows to mark routes through the lots, hopefully followed by wide shared-use pathways along the sides of the Adams and Merrimac lots), skateboard parking racks near buildings, and bike repair services. If you’re interested in helping plan, find funding, and/or advocate for these changes on campus, drop me a line! After more than an hour and a half of presentations, public comments, and discussion, the Costa Mesa City Council adopted the city’s draft Active Transportation Plan at their meeting last night. The vote was 4-1 in favor, with Mayor Genis and Council members Foley, Righeimer, and Stephens voting in favor and Mayor Pro Tem Mansoor voting against the motion. This is an exciting moment for users of active transportation in Costa Mesa, as the new plan includes proposals for dozens of miles of new or improved facilities for people who get around by bike, foot, or other forms of active transportation. 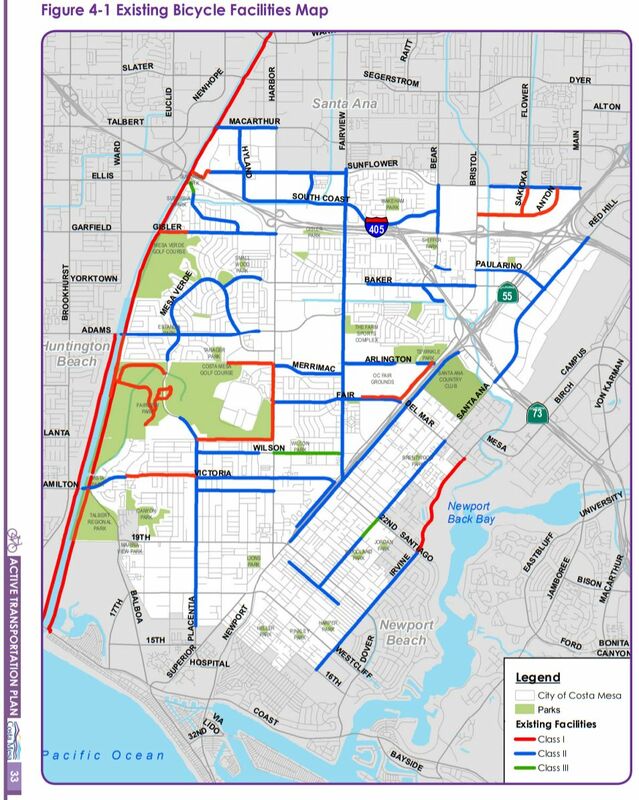 Map of Costa Mesa’s existing bike routes, from the October 2017 draft of the Costa Mesa Active Transportation Plan. Red lines are Class I facilities, blue lines are Class II, and green lines are Class III bike routes. Of note is that there are many gaps in the city’s active transportation infrastructure, and that most of the city’s existing facilities are on-street bike lanes (indicated as blue lines on the map) or bike routes (green lines) that lack any protection from cars besides paint. Map of existing and proposed active transportation facilities in Costa Mesa in the May 2018 version of the city’s draft Active Transportation Plan, as presented to the Costa Mesa Planning Commission. 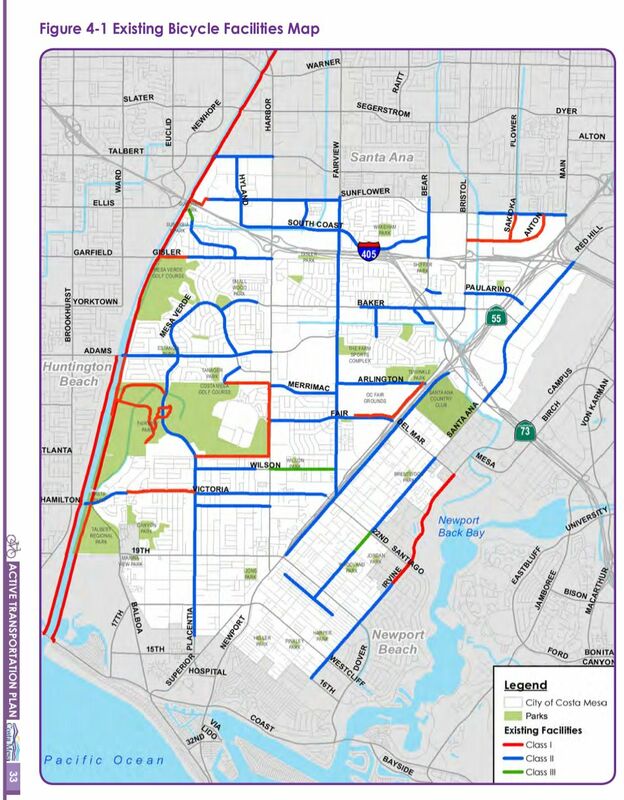 Red lines are Class I (off-street multi-use trails), blue lines are Class II (bike lanes), green lines are Class III (bike routes), purple lines are Class III (bike boulevards), and yellow lines are Class IV (protected bikeways). The new plan includes a tremendous amount of connectivity – users of active transportation wanting to get from one part of the city to another will be able to do so on facilities that link together seamlessly. Additionally, the plan includes the creation of roughly 15 miles of protected bike lanes and off-street multi-use trails, where bicyclists and other active transportation users are protected from cars by solid barriers or curbs. These improvements should dramatically increase the appeal of active transportation to residents of the city, thus helping reduce traffic in Costa Mesa and helping our residents be happier, healthier, and more engaged (as users of active transportation tend to be more locally-focused). The only major change made to the plan at the meeting was the deletion of the Class I trail extending from the end of 19th Street through Talbert Regional Park to the Santa Ana River Trail, due to that area being subject to county planning, not city planning. While we should celebrate this moment, a great plan is, of course, only the start: the city and its residents now need to prioritize and fund these projects, to help make the bright future this plan presents to us a reality. The map of existing and proposed active transportation facilities in the May 2018 version of the draft Costa Mesa Active Transportation Plan, as presented to the Costa Mesa Planning Commission. Document obtained from the planning commission’s May 14 agenda. 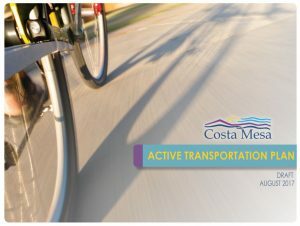 Costa Mesa’s draft Active Transportation Plan heads to the City Council this Tuesday (June 5) for consideration, after having been recommended for adoption by the City’s Planning Commission at their May 14 meeting. 1) The Tanager Drive Trail Extension, which would have run behind houses along Tanager Drive on the northern edge of the Costa Mesa Golf Course, has been removed from the plan. Additional Class III Bike Boulevards on the neighborhood streets nearby have been added (along Cardinal Drive and Swan Circle), essentially in line with Bill Burke’s, Mike Chun’s, and my joint letter. This change was approved by the city’s Bikeway and Walkability Committee at their April 4 meeting, apparently after the city had received additional feedback from local residents against the proposed trail extension. 2) The The Airport Channel / Delhi Channel Class I Off-Street Multi-Use Trail, which would have created a bicycle and pedestrian crossing of the 405 in the northeastern portion of the city, has been removed from the map but left in the text of the plan. I hope that this facility is able to remain a portion of the plan, as even though a Class I off-street multi-use trail in the area and bridge over the 405 would clearly be expensive and difficult to build, a safe crossing of the 405 in that area of Costa Mesa would dramatically improve active transportation in the region (just as the Santa Ana River Trail’s safe undercrossing of the 405 in western Costa Mesa has done for that side of the city). 3) The August draft left a gap in bike infrastructure along Pomona Avenue between Hamilton and 19th; in the revised plan this has been filled by the addition of a Class III bike route on the street. Given that this is the very area where a driver nearly hit a group of OCC bicyclists a few weeks ago, this is a needed change. 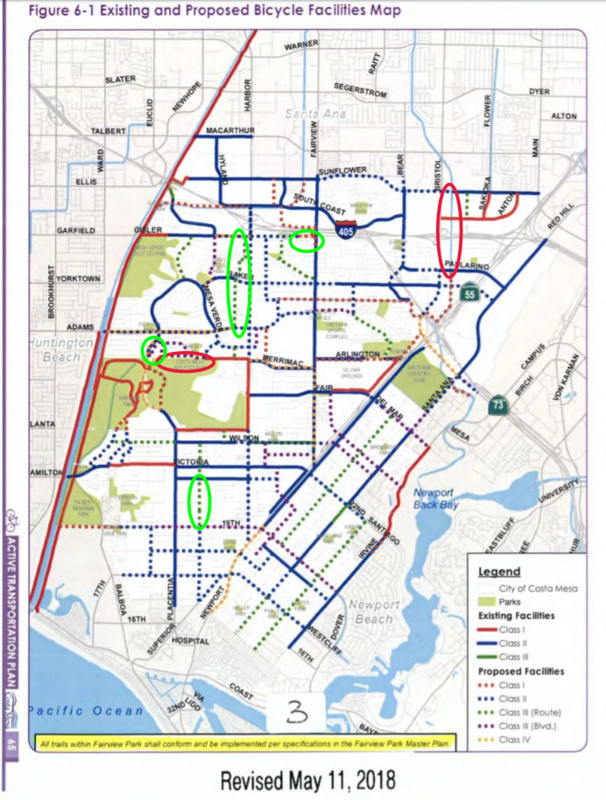 4) A Class III bike route was added to the streets (Royal Palm, Mace, Caraway, and Cinnamon) just west of Harbor Boulevard between Gisler and Adams, with the goal of providing cyclists an alternate to southbound Harbor Boulevard in that region of Costa Mesa. 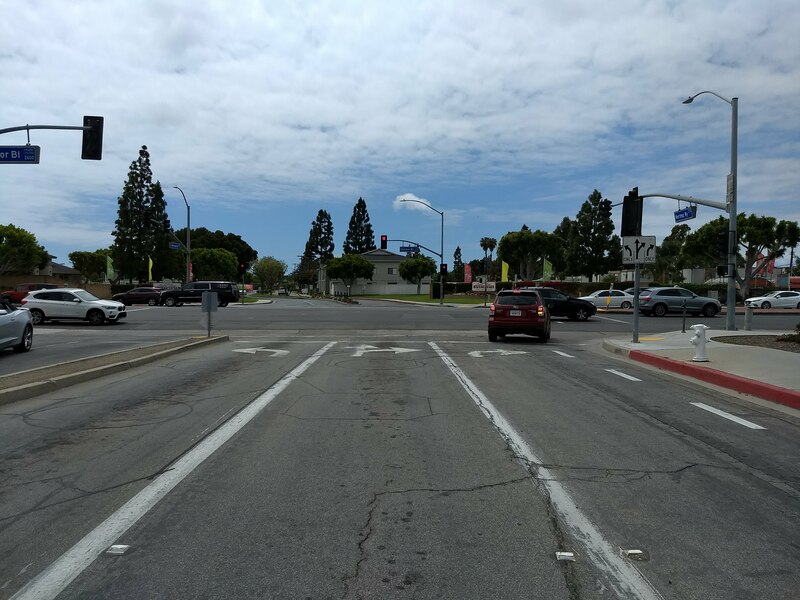 Nicknamed by some the “In-N-Out Trail,” this will allow cyclists to travel all the way from In-N-Out (Gisler and Harbor) nearly to Wilson on safer side streets, avoiding two miles of busy Harbor Boulevard without adding much distance (less than three-quarters of a mile extra travel). 5) The eastern edge of Gisler has had a Class I off-street multi-use trail connection to Fairview added, which will make Gisler a much more useful street for cyclists. Given that there is already a paved walking path already in existence in this area, this doesn’t seem like much of a change. 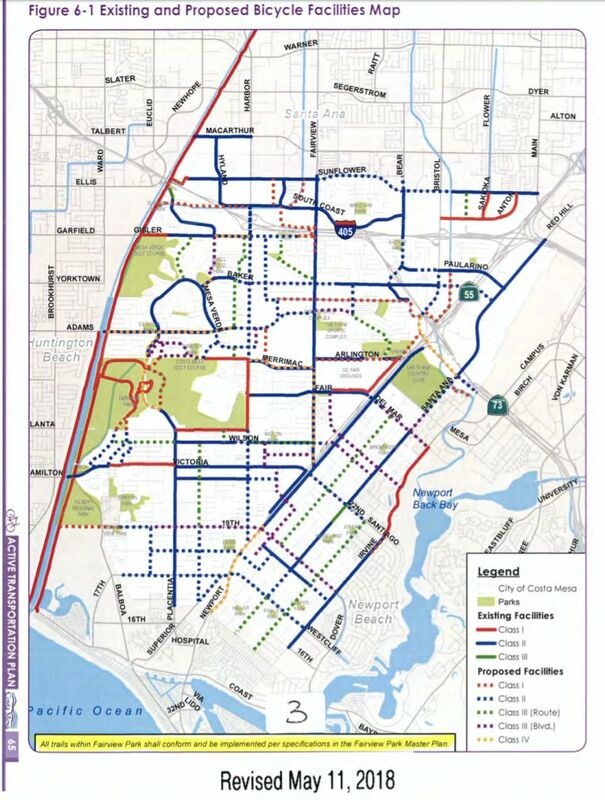 The map of existing and proposed active transportation facilities in Costa Mesa in the May 2018 version of the city’s draft Active Transportation Plan, as presented to the Costa Mesa Planning Commission. Changes from the same image in the August 2017 draft of the plan have been highlighted (green are additions, red are deletions). During the Bikeway and Walkability public outreach session on Wednesday December 6, Bill Burke, a resident of Tanager Drive, used his public comment time to address my post on the proposed Tanager Trail extension. Bill, and many of his neighbors, attended the meeting to speak in favor of the overall active transportation plan, but against putting an off-street multi-use trail behind their houses. After the meeting we were able to talk, and I met with him and Mike Chun the following Saturday to discuss active transportation in and around the Tanager Drive area. The goal of this meeting was to give us an opportunity to share our personal views and experiences, and help us understand the issues better. I came out of the meeting with a much better understanding of their concerns, and a revised view of the situation. A diagram illustrating the connections around the Upper Birds neighborhood in Costa Mesa. Map from Google Maps in December 2017. 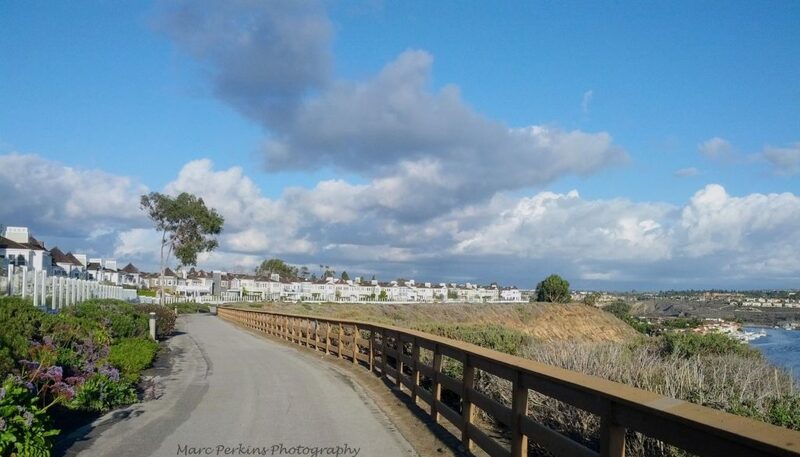 Directly to the southwest is Fairview Park, a prime destination in the area as well as home to a very useful connection to the Santa Ana River Trail and Huntington Beach. Also to the southwest is Placentia Avenue, which connects to homes, shopping, schools, and more. To the northwest are homes in Mesa Verde, Estancia Park, Adams Avenue (which leads to Huntington Beach), and additional connections to the Santa Ana River Trail (at Gisler or Moon Park) for those traveling north. 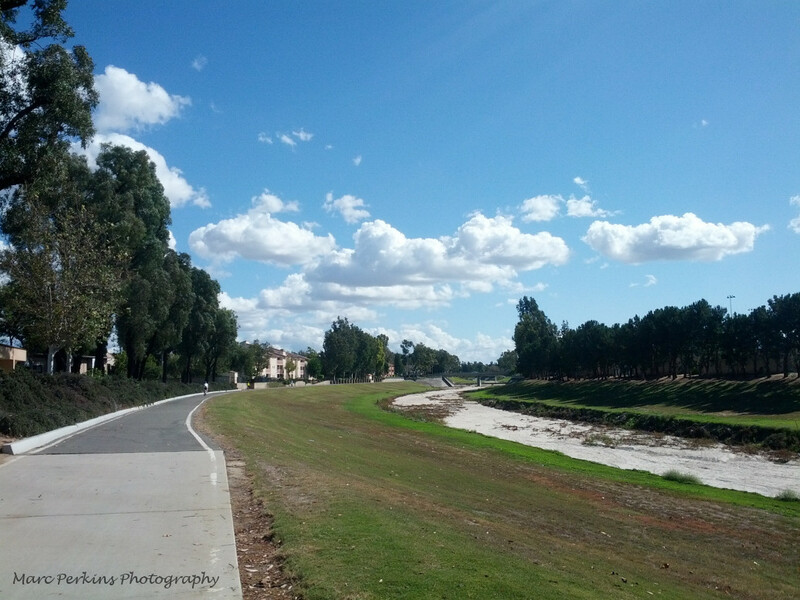 To the southeast is the existing Tanager Drive Trail, which connects to the Harbor Village Apartments, Harbor Boulevard (for shopping and more), the homes in College Park, and Orange Coast College. 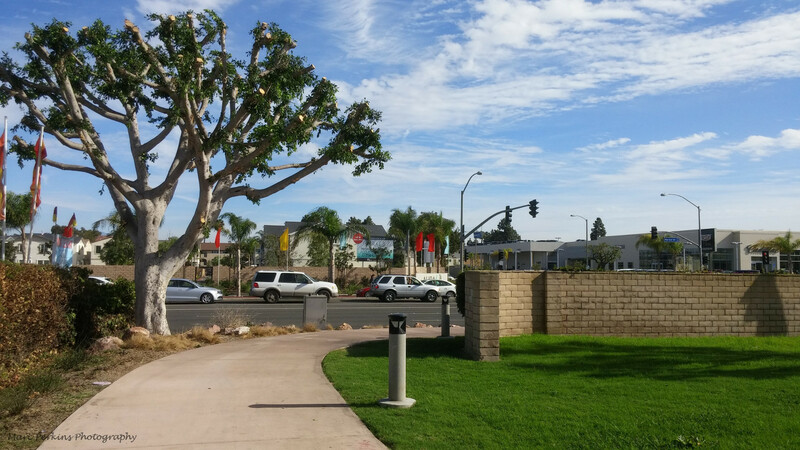 To the northeast, along Golf Course Drive and Mesa Verde East, are connections to shopping, additional residences (including the eastern part of Mesa Verde and the many apartments at 27 Seventy Five Mesa Verde), and another route to Orange Coast College. Creating quality active transportation connections through this neighborhood will allow people traveling between all these points to do so more safely and easily. Students traveling between Orange Coast College and Huntington Beach, people heading to Fairview Park, folks heading to shopping near the Harbor and Adams intersection, commuters on their way to work, families out for a trip to the beach, and more could all use a connection in this region. But currently it’s not at all clear how to navigate the neighborhood (e.g., I had a student who lived in this neighborhood for more than a year but didn’t realize that the Tanager Drive Trail existed). A way to link all of those destinations in a clear, easy-to-navigate manner would be to create an off-street multi-use trail along the north side of the golf course, as discussed in this post. Something I made clear when talking with Bill and Mike, and want to make clear here, is that while discussing a proposed extension of the Tanager Drive off-street multi-use trail I am not talking about building a “caged bike trail” that is a narrow strip of bumpy asphalt dominated by a looming chain-link fence. I would be opposed to building such a structure; fenced-in, narrow trails are, among other problems, unsightly (to both trail users and local residents) and unwelcoming to many potential trail users. When I see plans to put a Class I trail on the north side of the golf course, I see a trail like the one just north of Castaways Park, or the San Diego Creek Trail, or the Harbor Cornerstone Trail: beautiful, wide, nicely lit, well-landscaped trails that are welcoming to all and are designed in such a way as to deter crime to the adjacent properties (e.g., by putting dense vegetation adjacent to property fence lines). I’ve taught at Orange Coast College for fifteen years, and for all of those years I’ve lived within walking and biking distance of the campus. Being able to bike or walk to work every morning has been a tremendous asset in my life; instead of sitting in traffic fuming, I get to start every day with a short ride or walk through the pleasant Costa Mesa weather, possibly stopping in a park to enjoy my tea if I’ve got a bit of extra time. I’m happier, healthier, and fitter (and a better teacher) thanks to biking and walking to work. 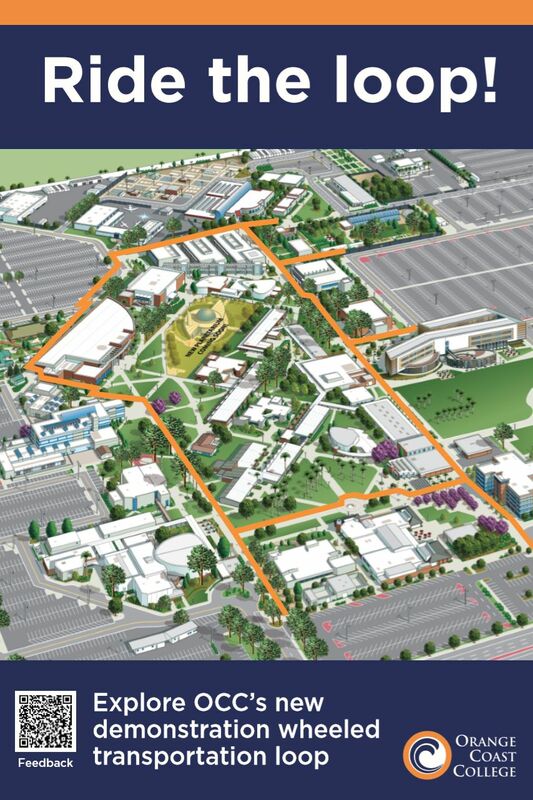 The existing active transportation facilities around Orange Coast College, as seen in the August 2017 draft of the Costa Mesa Active Transportation Plan. 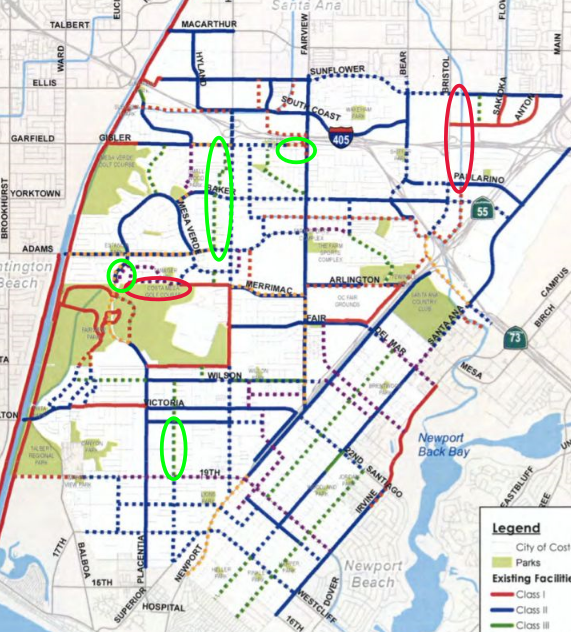 Red lines are off-street multi-use trails, blue lines are bike lanes, and green lines are bike routes. The proposed active transportation facilities around Orange Coast College, as seen in the August 2017 draft of the Costa Mesa Active Transportation Plan. Red lines are off-street multi-use trails, blue lines are bike lanes, yellow lines are protected bikeways, green lines are bike routes, and purple lines are bicycle boulevards. Solid lines are existing facilities, dashed lines are proposed new facilities. In this article I will discuss the current state of active transportation (walking, bicycling, jogging, etc.) infrastructure on the northern side of the Costa Mesa Golf Course and Fairview Park, and then go over the proposals included in the city’s draft active transportation plan. To jump straight to the discussion of the proposals, click here. 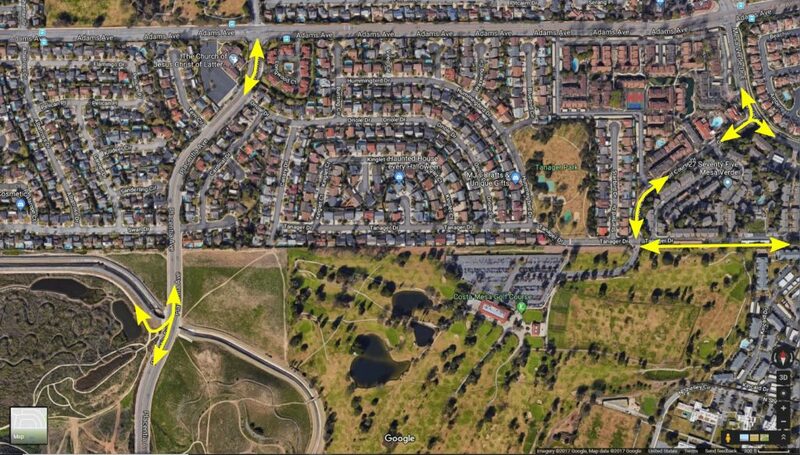 The Tanager Drive Trail is an off-street multi-use trail leading from Harbor Boulevard to Golf Course Drive. 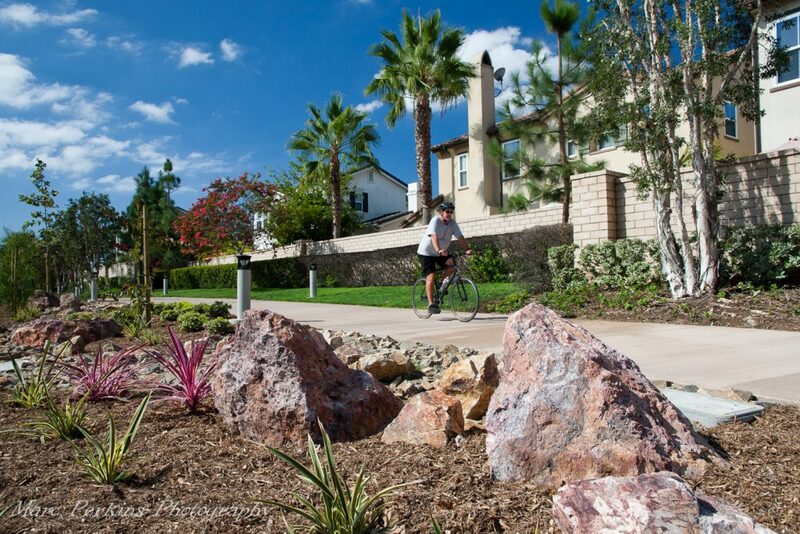 The trail runs along the northern border of the Harbor Village apartments and the northeastern border of the Costa Mesa Golf Course. The trail was recently repaved, and is frequently used by local residents (including yours truly, who bikes to work on it most days). 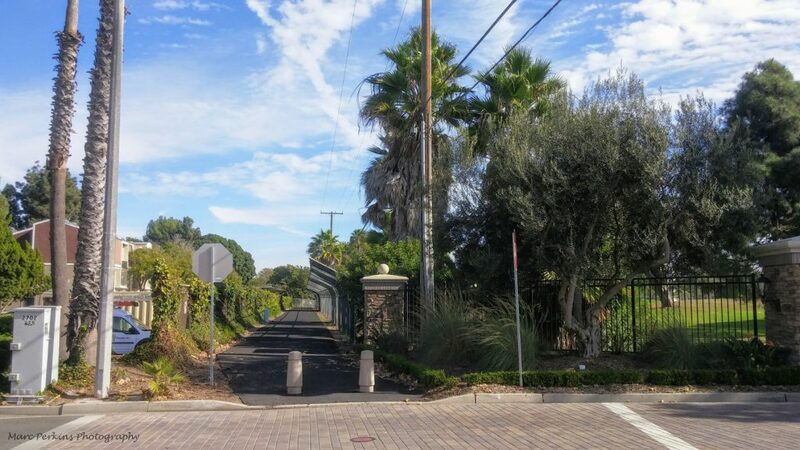 The Tanager Drive Trail connects with the Harbor Cornerstone Trail, which connects to the Joann Street Trail, allowing people to easily access the Tanager Drive Trail from multiple areas of Harbor Boulevard. 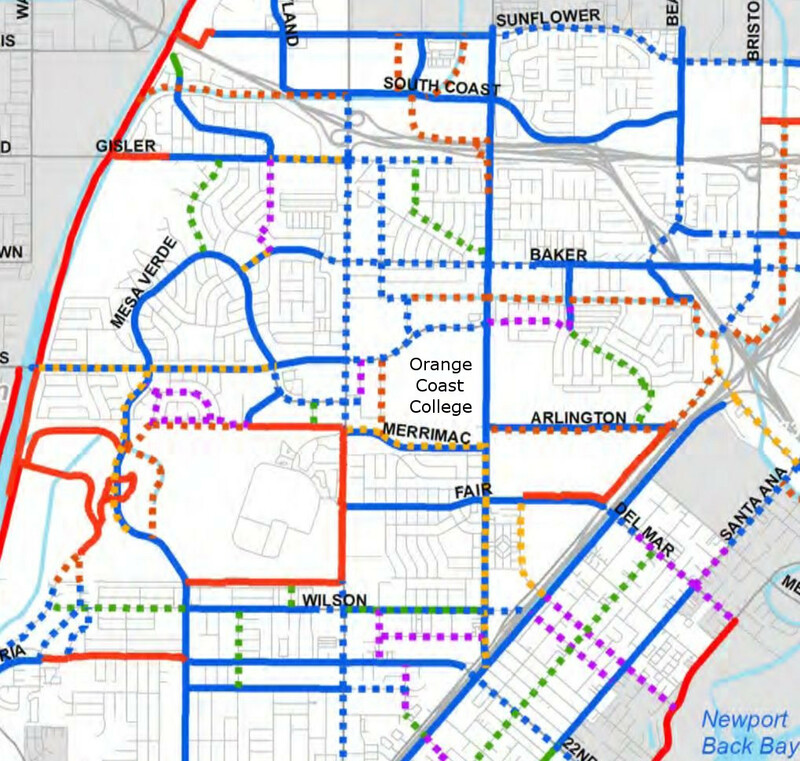 The city of Costa Mesa is working on a new active transportation plan. The plan is being drafted by Stantec, with input from city residents, city staff, and the city’s Bikeway and Walkability committee. The most recent version of the plan available online is the August 2017 draft. The Bikeway and Walkability Committee is currently soliciting public input on the plan, with the second of two public outreach sessions happening Wednesday, December 6, 2017 at 7:00pm in conference room 1A at Costa Mesa City Hall. To help people understand this new plan, which is more than 75 pages long, I’ll try to summarize some of the key elements in this post. The city currently has 43.5 miles of bike routes, though only nine of those are Class I (off-street) bicycle paths that completely separate cyclists from traffic; most of the rest are bike lanes painted on the edge of roadways. Map of Costa Mesa’s existing bike facilities, from the August 2017 draft of the Costa Mesa Active Transportation Plan. 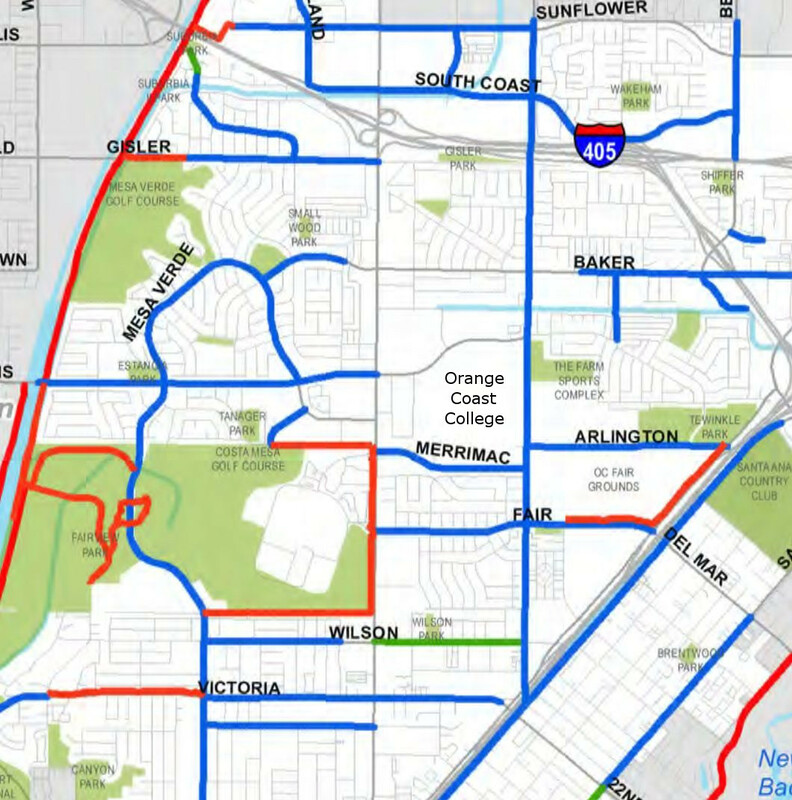 Red lines are Class I (off-street multi-use trails), blue lines are Class II (bike lanes), and green lines are Class III (bike routes). A person on a bike rides along the Harbor Cornerstone Bike Trail in Costa Mesa. Indicated on the map with red lines, these are pathways that completely separate the people on them from motor vehicle traffic. These are by far the most welcoming to people of all ages and all skill levels, such as children, inexperienced bicyclists, or people with disabilities. Class I trails are not just for cyclists: dog walkers, roller skaters, joggers, kids on scooters, and everyone else can use them too. 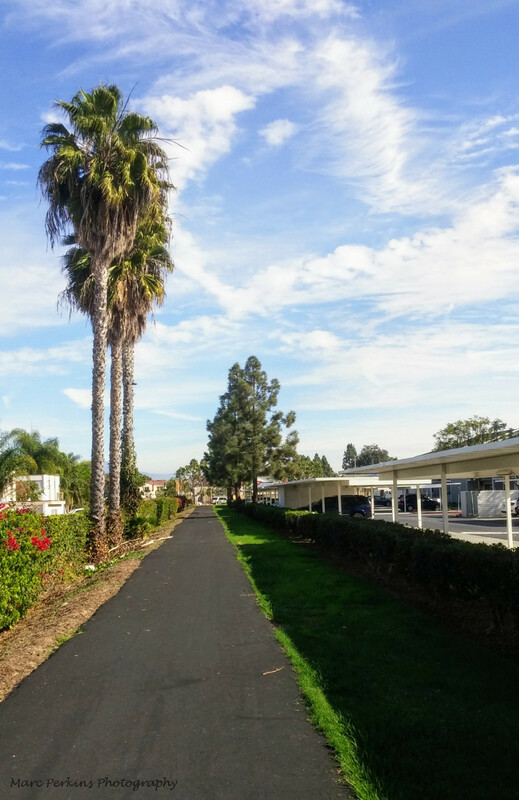 The shining star of Class I bicycle paths in Costa Mesa is the Harbor Boulevard Cornerstone Trail, built in 2016, that runs along Harbor between Merrimac and Fair. 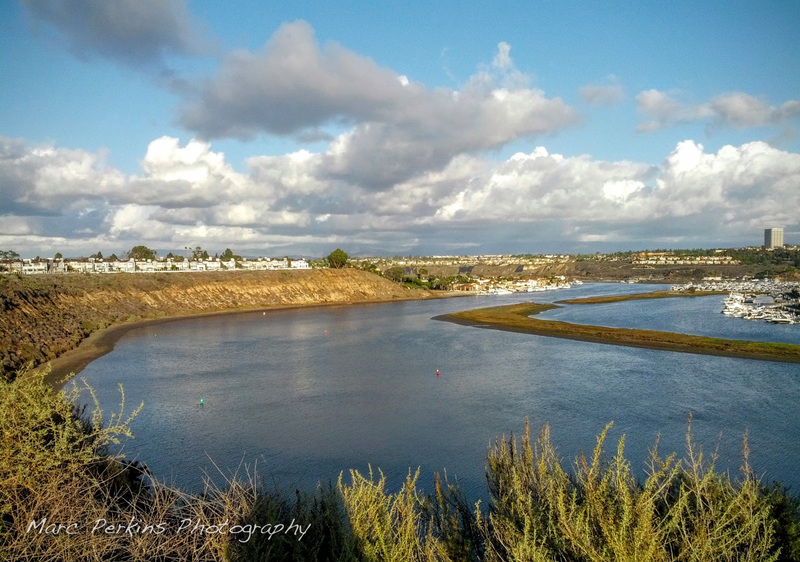 Some of the best cycling/walking/recreational areas in the county are anchored by Class I trails: Newport Back Bay, the San Diego Creek Trail, Castaways Park, and more. The trail that leads north out of Castaways Park heads along the cliffs above Newport Back Bay and behind some gorgeous homes. It’s a beautiful example of a Class I trail. 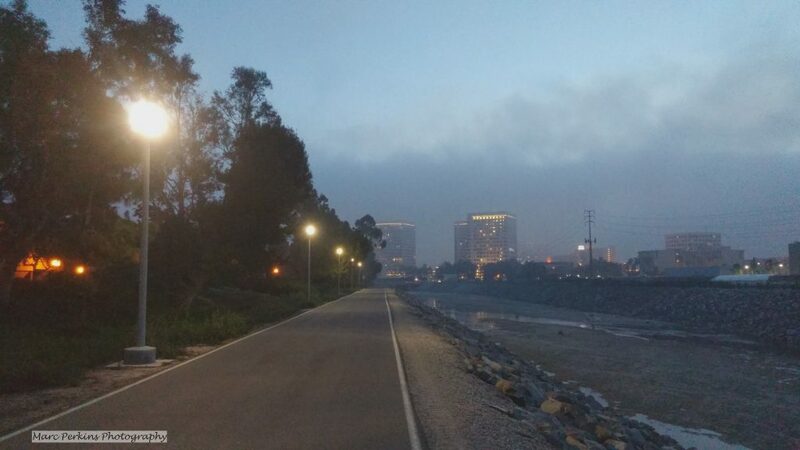 A foggy evening on the San Diego Creek Trail in Irvine. Newport Back Bay seen from Castaways Park. Newport Back Bay is a gem of central Orange County. It’s a wetlands estuary located just inland from Newport Harbor, and has roughly six miles of paved bike path that allow you to ride only feet away from nature. The views can be gorgeous, and I’ve seen many stunning sunsets while riding it. However, actually cycling around Newport Back Bay is more complicated than it should be because the bicycle path does not actually form a complete loop around the bay. On the eastern side the bike trail ends about a quarter mile north of PCH, and then doesn’t truly start up again until about a mile and a half north of PCH on the western side. Thus, riders wanting to do a true loop must fend for themselves and figure out how to get through PCH and city streets to get back to the trail. 21760. (b) The driver of a motor vehicle overtaking and passing a bicycle that is proceeding in the same direction on a highway shall pass in compliance with the requirements of this article applicable to overtaking and passing a vehicle, and shall do so at a safe distance that does not interfere with the safe operation of the overtaken bicycle, having due regard for the size and speed of the motor vehicle and the bicycle, traffic conditions, weather, visibility, and the surface and width of the highway. So, basically, cars must give bicyclists at least three feet of space when passing them, or slow to a reasonable speed and pass without risking injury to the cyclist. Given the frequency with which cyclists need to dodge debris (and just plain lose their balance), a three foot passing margin is really a good idea. Of course it’d be nice if police actually wrote tickets for violations of this law … but hey, I’ll take a sign as a good start. 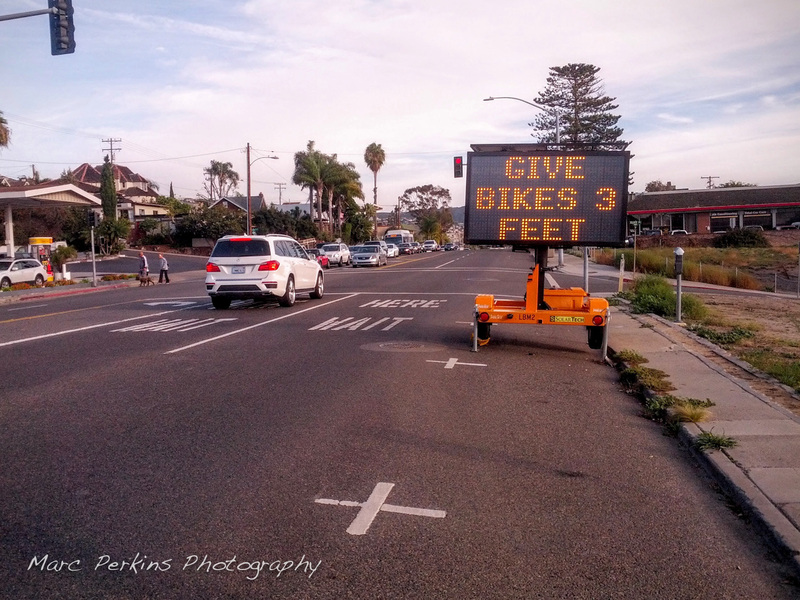 Seen on December 24, 2015 as I enjoyed a lovely ride down PCH.